This is it, friends, Monday, Nov. 7 "Chicken Scratch: Stories of Love, Risk & Poultry" officially launches into the world. 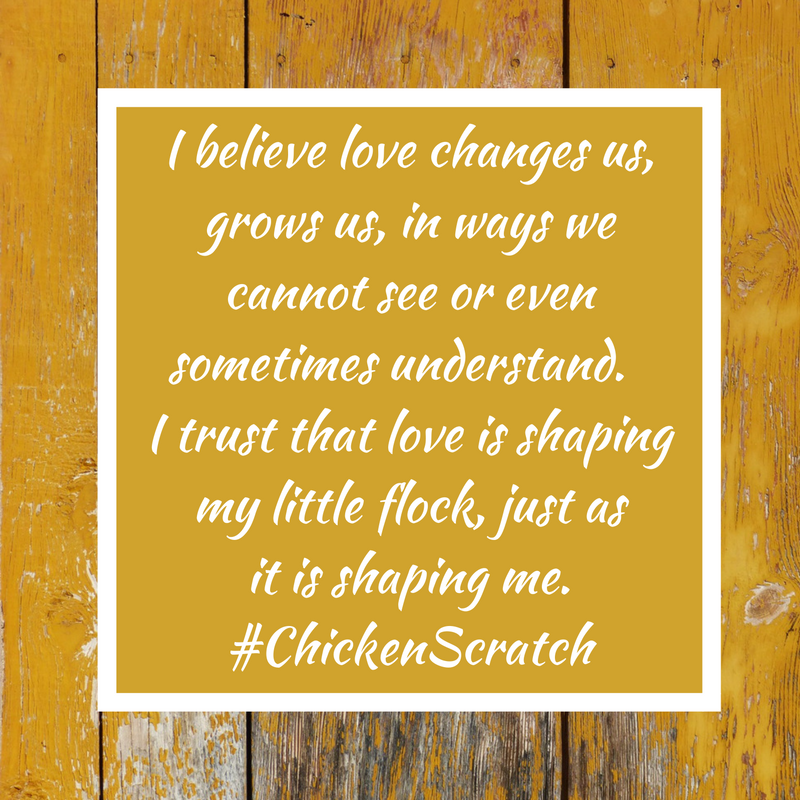 It's exciting and a little bit scary and so, in honor of that, I want to share an excerpt from the book - a story about love and risk, pain and joy. Enjoy and when you're done reading scroll down to see my free launch-day giveaways. Cold winds and thunderstorms settled into the area over the weekend. Saturday came and went in a fog of post-birthday-party exhaustion, and the sunny morning turned dark and windy by late afternoon. In the morning, our sleepy kids stayed inside playing on the Wii, and I walked down to the fence, hoping to talk awhile with our neighbor Ann. I spotted her husband, Don, in the yard first, closer to the fence. Based on two years of over-the-fence observation, I’ve reached the conclusion that Ann and Don’s yard is governed by a neat division of labor – Ann tends her teaming flowerbeds and Don putters in his vegetable garden. Both the beds and the garden put ours to shame, but John and I comfort ourselves by remembering that the Ann and Don are retired and not raising four young children. I’ve noticed a similar division of labor in their approach to the neighborly business of fence-side small-talk – Ann engages freely in extended conversation over a wide range of topics, and Don does not. Drawing Don to the fence to even ask a question is like pulling teeth. Attempt more and he’s clearly uncomfortable. One day last summer, when we were integrating our second round of chicks into our well established flock, the twins discovered one of the chicks named America, trapped tight in the far corner of the run. “She’s dead! America’s dead!” they cried, running into the house and pulling me out into the yard. Bending down to examine the chick I discovered a large bloody gash in her neck. It looked, in fact, like she’d been decapitated. I wasn’t sure what to do, and, more importantly, I didn’t want to deal with the dead bird alone while Isaiah and Levi ran enthusiastic circles around me. Standing up, I looked down toward Ann and Don’s yard hoping for help. I caught a glimpse of Don and approached casually under the guise of commiserating but seriously hoping to convince him to take care of the dead bird. Don, however, proved resilient in the face of my woman-in-distress ploy. “Oh,” he said, “that’s too bad.” He didn’t offer to help, and, knowing it wasn’t his responsibility, I couldn’t bring myself to ask. I would deal with the bird myself. When I got back to the chicken tractor I bent down again for a closer examination. The twins, bored already with death, had wandered off and in their absence, I noticed the rise and fall the chick’s fluffy feathers. She was still breathing, a clear sign she had not, in fact, been decapitated. I walked into the run and reached into the far back corner where she was huddled. Pulling her out and tucking her to my chest, I realized she was pecked up pretty badly but likely to survive. After a few days of isolation and over-the-counter antibiotic ointment, she was on the mend, and I had learned not to expect Don to play the Knight in Shining Armor. So I wasn’t looking to talk to Don Saturday morning, I was looking for Ann. I spotted her on the far side of their yard wearing shorts and tall black polka-dotted rain boots. Easily forgetting she’s close to 70 years old, I watched as she pushed a wheelbarrow full of mulch around to her flower beds. Seeing my approach, she made a bee-line to the fence, and we chatted about summer and the gigantic addition being added to a house on the hill behind our house. While we talked, Isaiah and Levi ran over yelling, “Miss. Ann! Miss. Ann!” They climbed briefly up and down the fence, lapping up her attention, then trotted off to play again. The reason I walked down to the fence was that I needed someone to talk to. The night before John and I had found out that dear friends of ours were separating, and our hearts were broken. When our chit-chat wound down, I told Ann about it. She affirmed the real pain of a marriage ending and how sad it is for everyone involved, sharing stories from her experience with the divorces of people she knows. So many of the married friends John and I share got married at the same time we did. We knew, even then, that the odds were high that many of us would not stay married. And yet now, some 15 years later, it still seemed impossible that some of our friends were entering into a post-marriage stage of life. “Maybe we’re naïve,” I said, “I’m almost 40. I don’t understand how these things still catch me by surprise.” What I really couldn’t understand was why it hurt so badly – hurt to see our friends in such complete and utter pain, hurt to be unable to fix it for them, to only be able to stand by watching, listening, and praying. Turning back to face our yard, I noticed the Polish hens and asked Ann if she’d seen them. She said she had but couldn’t really tell much about them since they were penned up in the run on the far side of our yard. “Do you see the fluff-headed ones?” I asked, my eyes following the Polish hens as they pecked along the perimeter of the netting. I described them for her in detail, painting a picture of their fluffy white pom-pom heads and lacy gray-black feathers. As I talked, I felt love for them rise in my chest despite the distance between us. Some days, I think that’s the most we can hope for – enough joy to carry us through the hurt. Maybe also, if we’re lucky, we might find a sturdy fence to lean on and a neighbor willing to listen for a few minutes or more. Today, I'm giving away two Prize Packages. 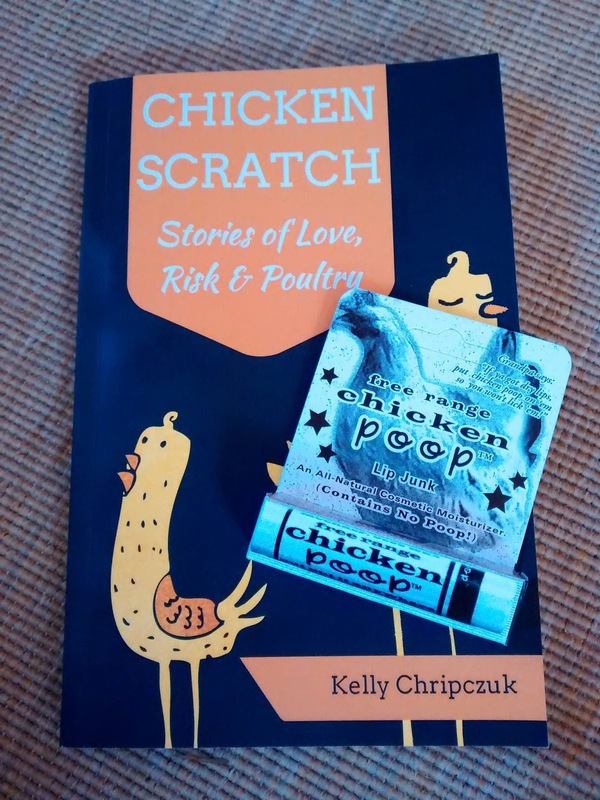 Two lucky winners will receive a signed copy of "Chicken Scratch" AND a "Chicken Poop" lip balm. (For the record, the lip balm contains NO poop and only natural ingredients like avocado oil, beeswax and jojoba oil.) Check out the Rafflecopter below to enter to win. Winners will be announced next Sunday. Kelly, I love that you shared on this quote today. I wrote my review a couple of weeks ago and that was the very same quote I used :) I have so enjoyed being a part of your launch team and getting to know you a little bit more! Thanks Joanne. I'm so grateful for your presence on this journey! Kelly, so excited for you. My review (already shared to Amazon) will be coming out on the blog on Wednesday. Congrats, Kelly! I loved the story here. Well written and inspiring. Thank you. Abudnant blessing to you and yours!